A surge in the number of tourists visiting Korea is creating a severe and chronic shortage of hotel rooms in Seoul, according to Chosun Ilbo. This summer saw the number of tourists visiting Korea pass 1 million a month. Eighty percent of them visited Seoul. It would take 36,000 hotel rooms in the city to accommodate them — 8,000 more than Seoul’s 24,308 rooms, according to Korea Tourism Organization. By comparison Tokyo has 124,000 rooms, London has 123,000 and New York, 86,230. Even Singapore, which is only about a quarter the size of Seoul, has 47,000. Many visitors are forced to find rooms in neighboring cities like Songtan, Euijeongbu, Incheon or Gwangmyeong. Some even go as far as Cheongju or Daejon in central S. Korea to find rooms. As a result many are forced to spend two hours each way to commute for each day of sightseeing in Seoul. Chinese visitors are particularly hard pressed to find rooms in or close to Seoul because of their preference for less expensive rooms in the 70,000 – 100,000-won ($62 – $89) range. Most hotels in central Seoul cost about 350,000 won ($310) a night. As a result many Chinese tourists end up in hotels that require several hours of shuttling back and forth each day. The experience sours many Chinese visitors to Korea, and some are choosing to skip Korea in favor of southeast Asia or Japan. The peak tourist season falls during the months of May, June, August and September when hotels must be booked three or four months in advance. In 2010 the city of Seoul launched an effort to boost the number of hotel rooms by converting older shopping malls, theaters and other underused structures into tourist-class hotels. However, that effort is expected to add only a fraction of the rooms needed to meet the shortage. 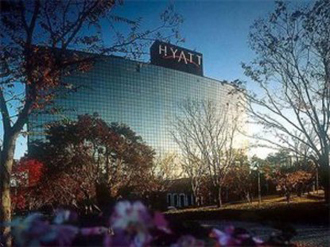 The Grand Hyatt on the southern slope of Namsan has been one of the Seoul's leading deluxe hotels since the 1980s.